For samarium cobalt magnets Series 1-5 which is shortened as SmCo5, they have one atom of rare earth Samarium and five atoms of Cobalt. 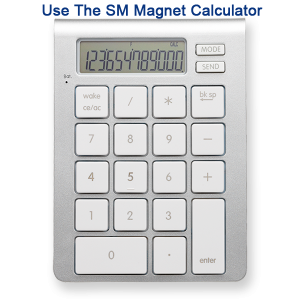 By weight this samarium cobalt magnet alloy will typically contain 36% Samarium with the balance Cobalt. The energy products of these samarium cobalt alloys range from 16 MGOe to 25 MGOe. Choose Neodymium Iron Boron magnets or not? People can academically appreciate the fact that every electric motor in the world works because of magnetism. One can reflect on the fact that every transformer uses it, too. CRT monitors, TVs, brushless DC motors, power meters, modern welding gear and engine ignition timing systems, various vending machines and umpteen other gadgets use permanent magnets.